Changeover day: Saturday in July and August, flexible at other times subject to availability. Short breaks and weekends also available - please enquire for details. 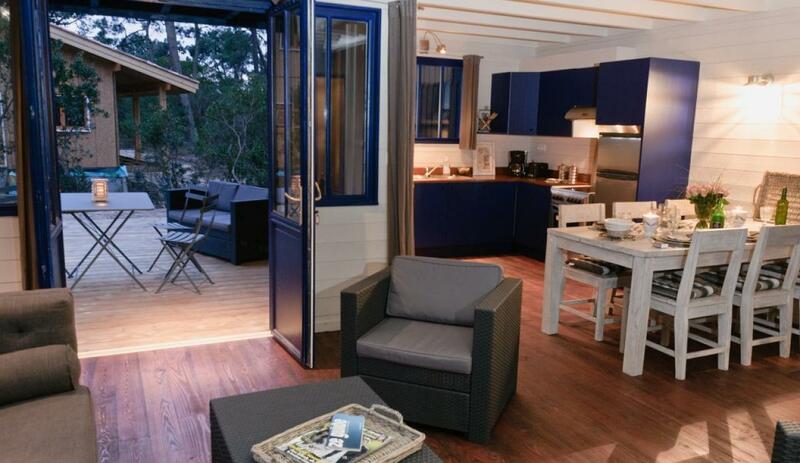 Cabanes du Boque offer stylish, well-equipped accommodation just a short walk from the Plage des Américains, and only 500m from Cap Ferret centre - it's an easy bike ride to the market, other beaches, restaurants & cafés. It's a lovely location for exploring a unique corner of France. Cap Ferret enthusiasts and anybody attracted to the area's unique combination of lovely beaches and chic, laid-back lifestyle. Teenagers: good, safe area for teenagers to be independent, plus nightlife if they want it! One of the chalets is close to a fairly busy road - 10% discount applies. 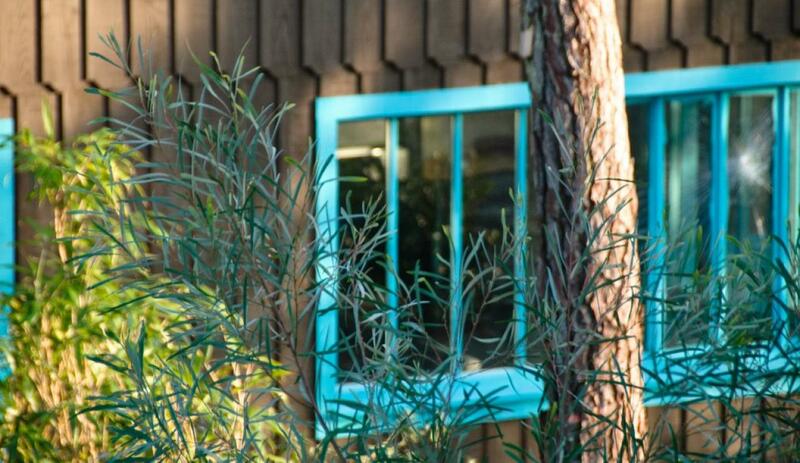 (Specific chalets are reserved when you book, we would tell you if this is the only one available.) Outside spaces are not completely private, although there is some screening. 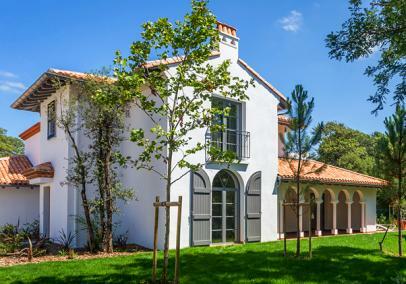 Cap Ferret village is one of France's chic-est holiday destinations featuring smart boutiques, cafés and restaurants in a low-rise, laid-back setting - the ambience is casual and relaxed, but appreciative of good living. The bay is renowned for sailing & oysters, the Atlantic beach is superb. It's easy to get around. An Aquitaine gem! 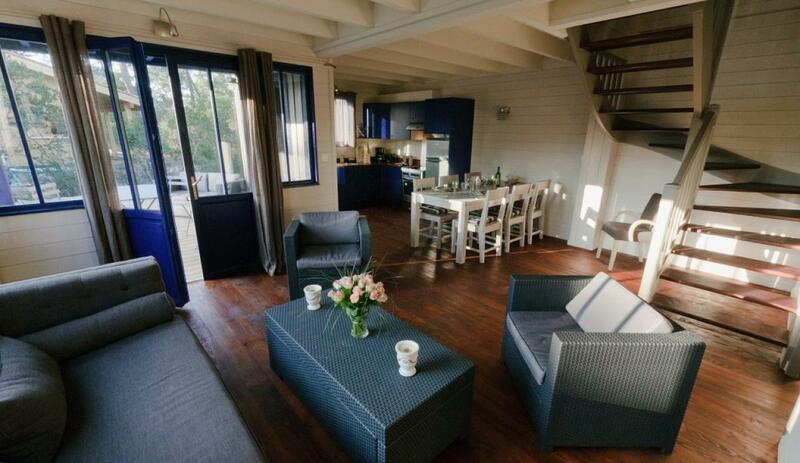 Les Cabanes du Boque comprise a dozen chalets in three clusters of four. The chalets are oriented in each cluster so as to overlook one another as little as possible, and hedges have been planted too. However, outside spaces are not completely private. The site has a separate entrance and car park. The chalets are accessed via a small network of footpaths around the site. 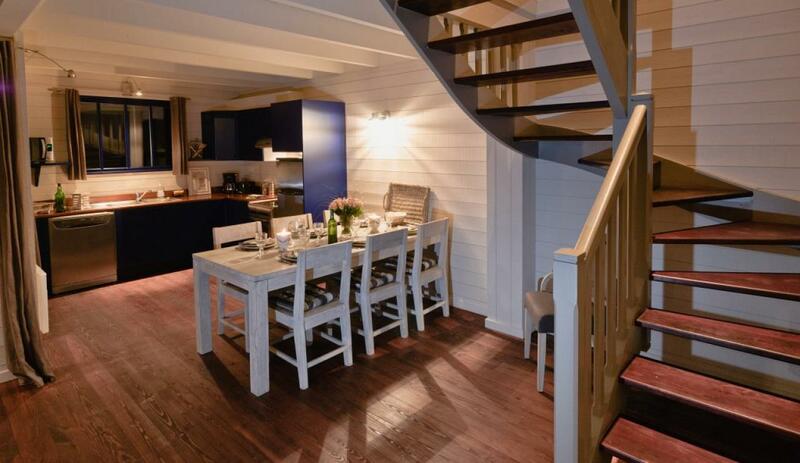 The design is a contemporary take on the classic wooden Cap Ferret oyster cabin, using good quality furnishings & fittings. 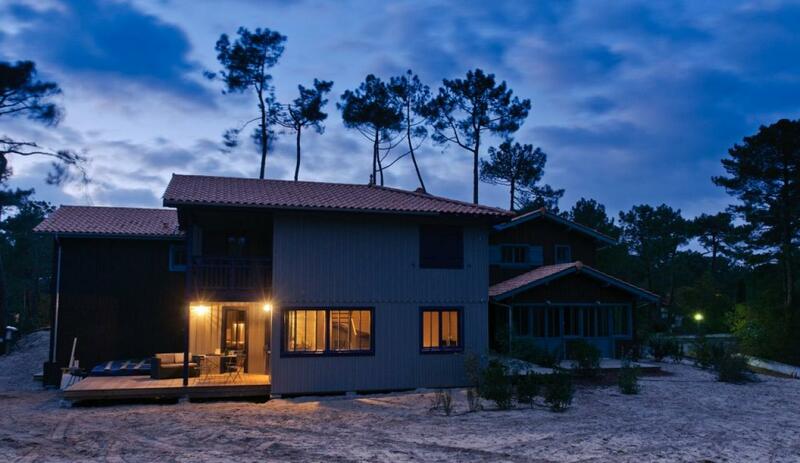 Each chalet is a good size, 90 - 110m2. 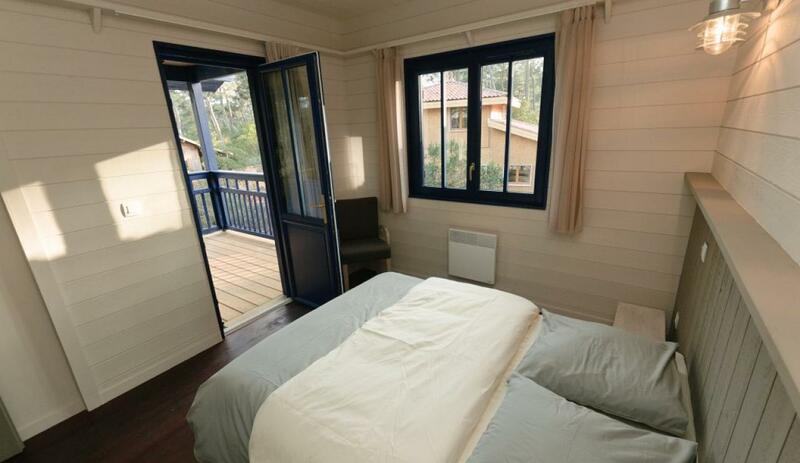 In all but three of the chalets all the bedrooms and bath/shower rooms are upstairs. Each of the bedroom has hanging space or a cupboard. T4: two doubles (both 140 cm) plus either a twin bedroom or bunk bed room. One of the doubles usually opens on to an upstairs balcony. T5: as above with twin bedroom and bunk bedroom. 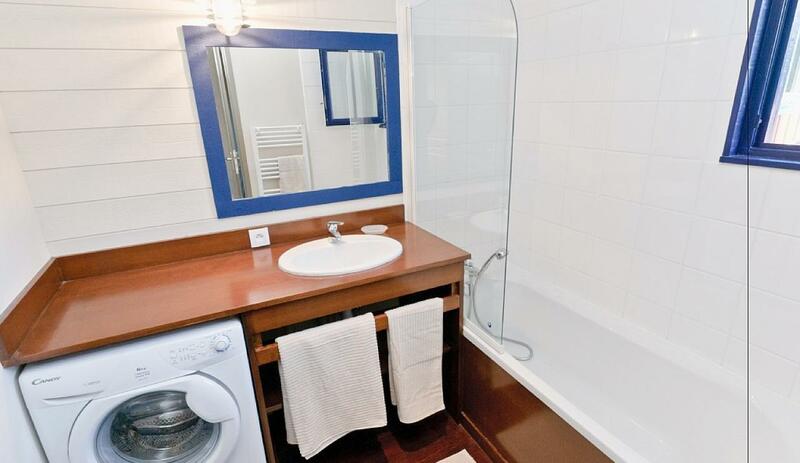 There is also a shower room and a bathroom (bath with shower attachment) upstairs. The washing machine is in the bathroom. There are separate WCs downstairs and up. 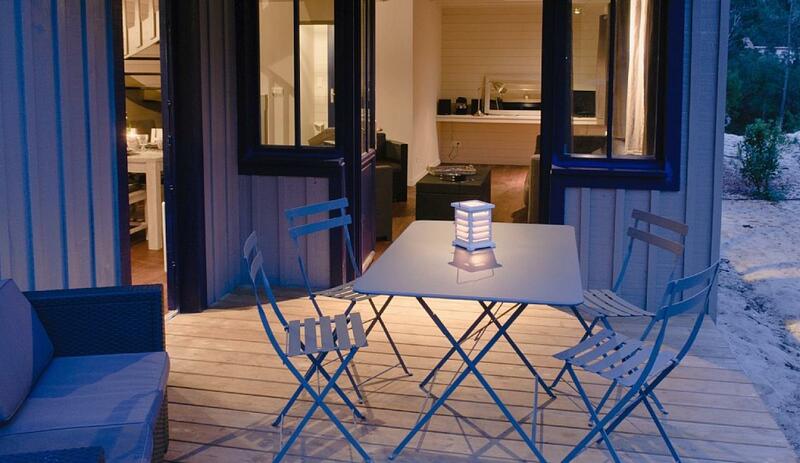 The outside terrace is approx. 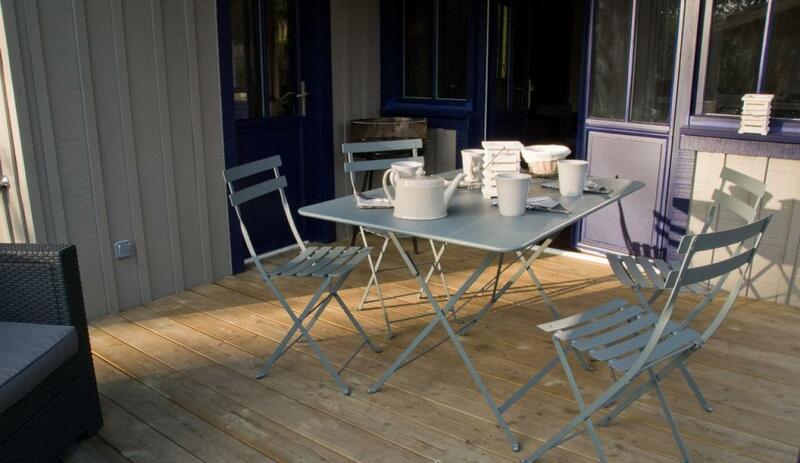 10m2, with garden table & 6 chairs, barbecue, and two sun loungers. Hot tub T4 Spa: three which also have a outdoor hot tub (supplement applies - please see Prices & Availability tab). 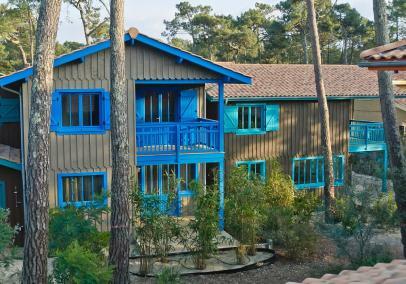 The chalets are 150m from the plage des Américains (which faces the bay), 200m from the jetty (foot ferries to Arcachon) and 500m from Cap Ferret centre. 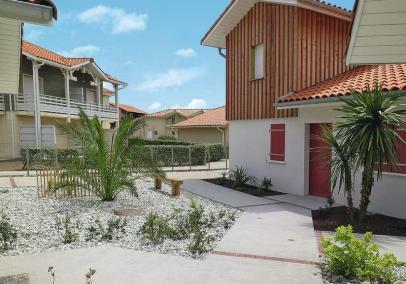 It's a short bike ride (1 km) to the beautiful plage de L'Horizon Atlantic-facing beach. Service: Super service from Alternative Aquitaine. Product: Lovely villa, in great location. Clean and comfortable. I would happily recommend this place. It had a lovely setting and relaxed feel. It is nearly 5 star for us but being asked to strip beds on leaving; I can kind of understand but it's a higher end price point not a hostel and would have expected not to have to do this. Similarly, emptying the dishwasher on last day and having to be out by 10 was a bit annoying as the dishwasher takes time to complete. It was generally well equipped but lacking a fish slice which makes cooking pancakes difficult. These are all easy to remedy and it would have 5 stars if this was the case. Don't be put off by these three minor points it really was fab and isn't it traditional for rental properties to have some piece of equipment missing! Thanks to Helene, we did enjoy it, we could happily have stayed another week. Product Comment: Thank you for your feedback. 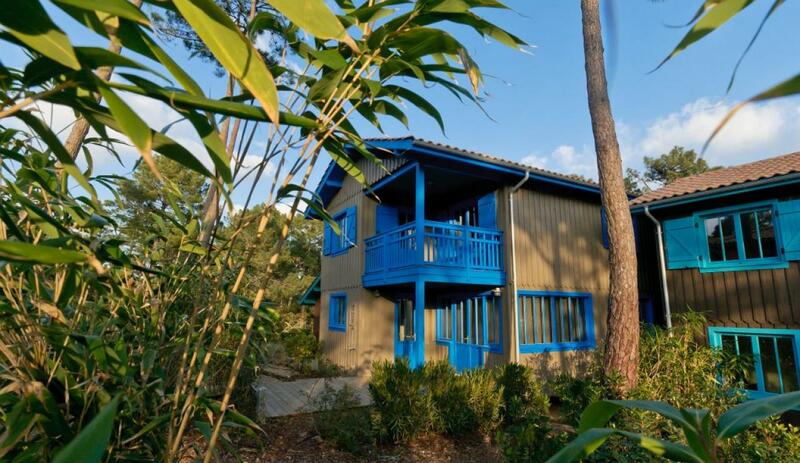 The Cabanes enjoy a fantastic location, convenient for the beaches and village. It's definitely not 5-Star and I do understand what you mean re stripping beds, etc - not unusual with French rentals. Really pleased that you enjoyed your stay and I agree Helene is a lovely host. Service: Really good. Very helpful throughout booking process. Property and destination just as described. Will definitely be booking through Alternative Aquitaine again. Product: Pleasant, informative greeting by family owners. Basic, spacious and clean. Well presented accomodation. Suggestions for improvement: Would have benefitted from more/better lighting in several of the rooms, better selection of TV channels (i.e. Not just French) and we would have appreciated a 'room safe' in cabin. However property as described in Alternative Aquitaine literature. Service: Very helpful. Pleasant to deal with. No problems. Product: Great location. Near to everything. Service Comment: Great small company with a personal feel.